8 Days Until the 2018 Cross and Shield Gala. The Big Day is Almost Here! Tickets Sales on Pace to Sell Out the 2018 Gala. We are fast approaching the capacity of the Marriott Waterside Ballroom, so if you haven't purchased your tickets, go to www.BidPal.net/cs18 to register online. Don't miss out. BidPal Mobile Bidding - the Cross and Shield Gala on your mobile device. BidPal is once again the event management software for the 2018 Cross and Shield. Learn more about how BidPal will enhance your Cross and Shield experience. View a video about BidPal Mobile Bidding at this link. Stock up your wine cellars. The TC Wine Pull returns for the 2018 gala. For $20, pick a numbered cork and win the mystery bottle with that number. All bottles are worth more than $20 and there is a $100 bottle and several $40-$50 bottles. Champagne and Diamonds - win a diamond bracelet. 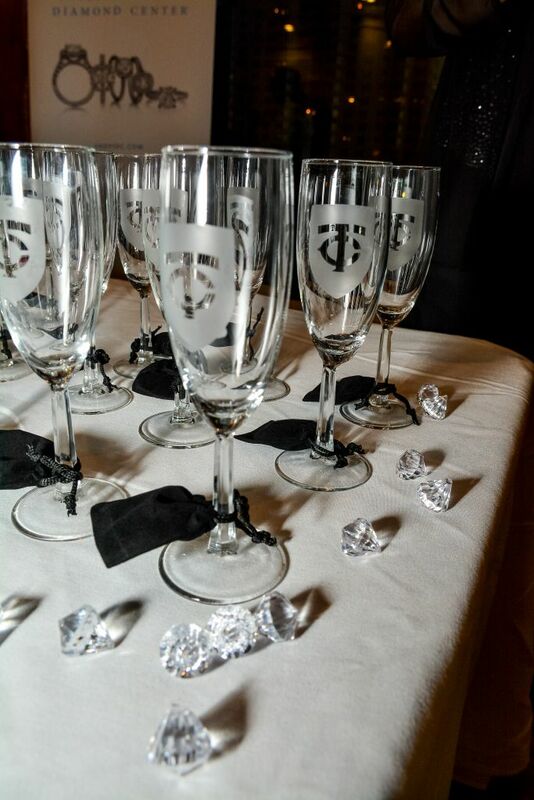 Purchase a glass of champagne for $20 or $50 for 2 glasses in a special etched TC champagne glass. With each glass is a pouch with a number. If your number is drawn at the gala, you win a 14k white gold diamond bangle bracelet featuring 20 round brilliant cut diamonds in a swirl design with a total diamond weight of 1.00 carats. 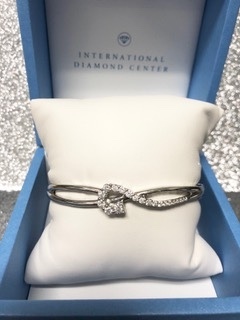 Diamond Bracelet donated by International Diamond Center. A vacation experience in Steinhatchee, Florida. The Marriott Waterside chefs have prepared a delicious menu for your dining pleasure. Starting with passed hors d'oeuvres and a premium bar, you will enjoy a dinner of salad,Filet Mignon and Grilled Chicken Breast and a special dessert. Click here for complete 2018 Cross and Shield Gala information and a list of sponsors and patrons. Your invitations are on the way! Formal invitations will be mailed next week for the March 3, 2018 Cross and Shield Gala. All TC families were mailed a packet with information on auction item donations, a auction item wish list and patron opportunities. Auction Items - If you have any auction items to donate , please fill out the form and mail it back to the TC or you my drop the items off at the front desk. Contact Auction Acquisition Committee chairs Linda Berardi P’19, ’21 (lindaberardi@hotmail.com) or Yasmeen Neuman P’21 (yasmeenneuman@gmail.com) for questions or item ideas. Save time - register online! Online reservations can be made by using the BidPal Cross and Shield portal. 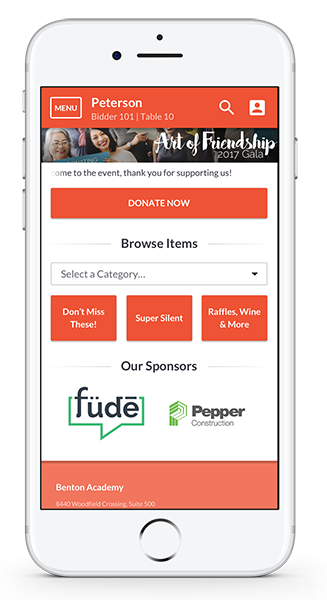 BidPal is our mobile auction partner for the 2nd year. Sponsor and Patron Update - A big Cross and Shield “thank you” to Specialized Property Services - Dan and Catherine Martucci P’19 who are the 2018 Cross and Shield BidPal Sponsor. Their support allows us to offer BidPal as our online registration partner. All bidding at the auction will be made by using the BidPal mobile bidding service. Visit our Gala Portal to register and view auction items as they are posted. SOLD OUT - Make it a weekend. Stay at the Marriott Waterside. There are a limited number of rooms blocked for the evening of March 3, 2018 for the Cross and Shield Gala. Rooms are at a special rate of $259 for the night. Reservations must be made by February 2, 2018 through the Passkey web site. CLICK HERE to make your reservations now!